A few years ago I was quaffing a bottle of merlot, in Paris (as you do) with a friend from junior school. That day we’d walked along the Avenue des Champs-Élysées, visited the Arc de Triomphe, marvelled at the delights of the Louvre and lost our breath at the top of the Eiffel Tower and were now sitting on the edge of the bathtub, our jeans rolled up to our knees, soothing our blistered feet in cold water. We collapsed with laughter causing tidal waves in the bathtub as we kicked our feet then we refilled our wineglasses and moved on to discuss the many attributes of Bon Jovi, who was at the time plastered all over the Paris metro stations. I laugh every time I think about that. I went to ballet lessons for a term when I was about ten. I enjoyed myself too, but even then I knew I lacked co-ords. I still need to think a beat before knowing my left from my right and grace and poise are not words that spring to mind when my name is mentioned. I have no idea what made me paint a ballerina. Perhaps I li ked the pink paint and couldn’t think of any other profession that required a pink outfit. Maybe it was the ABBA song about the pretty ballerina being the ‘queen of the dancing floor’. Or most likely I’d just read a book about a ballerina. I had a tendency to want to be a detective whilst reading the Nancy Drew series, and wanting to be a nurse while reading about Sue Barton. I was never concerned about being a detective who’s afraid of the dark, or a nurse who really, really doesn’t like blood. A few Wednesday mornings ago, I discovered that the Russian ballet was in town for one more night and I rushed to Computicket. I know about the Bolshoi, simply because I like to travel and Russia is an exotic destination I have not yet visited. So that night I dressed in my finest and descended on the Playhouse with lots of chocolate. I know nothing about ballet except for a few random words. I had no idea what to expect and I never for one moment considered a transformation. The audience were noisy until the lights died. There wasn’t a murmur after that as the spotlight hovered over the heap of bodies lying on centre stage. With featherlike grace the bodies rose and floated across the stage. I recognised snippets from Romeo & Juliette and Swan Lake, everything else was mind boggling in my ignorance. By intermission my toes were aching from all that pointe work and I imagined for a moment the torture those dancers endured each rehearsal. 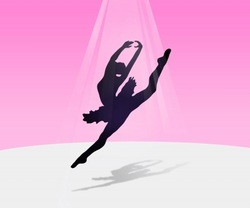 Ballerina is not a job for someone without an unstinting passion for ballet. It’s not a future for someone who prefers to sit at a laptop with a mug of coffee and a snack, or five. I hadn’t noticed the tingling protestation of my legs until intermission and then their angst multiplied at having been folded into such a small space high up in the rafters of the Playhouse. When the lights came up they demanded I move so I roused myself to stand in Smith Street (or is that Anton Lembede Street?) and survey the stomping of the real world. The second half was as enchanting, with dizzying rond de jambe and pas de poisson and grand jeté moves that made my heart soar along to Tchaikovsky’s violins. But, as with all good things, the floodlights eventually illuminated the stage and turned the dancers back into human beings. I’d been taken to a surreal world and it seemed harsh to have to now find my car on the eleventh floor of the Royal Hotel parking lot and drive the mean streets home. It was only when I reached into my bag for my car keys that I discovered the chocolate. I didn’t eat as I drove, instead I revelled in the slither of adrenaline floating in my veins and hoped the glow wouldn’t disappear too soon.